Greater Nourishment Publishing, 9780997217506, 552pp. Seasoned with Gratitude is an innovative cookbook infusing mouth-watering recipes with reverence for the sacred gift of life. A cookbook for all dietary persuasions — vegetarian and carnivore, paleo and gluten-free, which encourages the use of fresh, sustainably-raised ingredients. In recipes from breakfast through desserts, discover morsels of scientific research and folk wisdom, as well as blessings and practices to share and nurture awareness of our place in the circle of life. Succulent one-pot dishes, 30-minute meals or those that take all-day; include robust meat or vegetable stocks, healthy fats, and savory ways to include abundant vegetables. 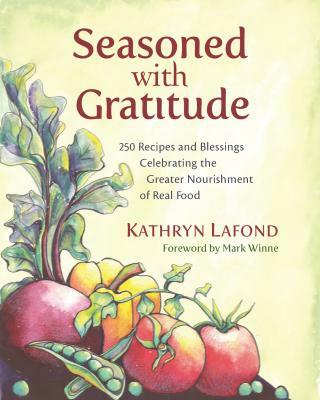 Author Kathryn Lafond reminds us that preparing and eating food is how we heal, comfort, and connect with others and suggests by including the secret ingredient of gratitude, we just might gain even greater nourishment. Kathryn Lafond, known for her love of prayer, song and ceremony, is devoted to helping us remember that all life is sacred and that cooking is the act that transforms the sacred plants and animals into nourishment. For over 20 years she has served her community as an Intuitive Energy Healer, spiritual guide, writer, health coach, home-chef, as well as teacher of Wild Foods and Medicine classes. She is the author of Seasoned with Gratitude: 250 Recipes & Blessings Celebrating the Greater Nourishment of Real Food. Kathryn worked as a professional chef and caterer for 11 years, although most of her cooking inspiration and creativity draws from over two decades of raising and feeding her family. As an intuitive healer and health coach, she has worked with clients throughout the country; taught cooking, foraging, and spirituality classes; and has been featured as a guest speaker and singer. In 2008, she wrote and produced a full-length CD of spiritual music. From 2005-2009 she wrote and published a quarterly health newsletter after experiencing a life-threatening illness. In Seasoned with Gratitude, Kathryn brings a reverent perspective to preparing food and nourishing bodies. Kathryn says: It is my hope that when people understand that they too are a part of an interconnected web of life, they will take better care of themselves and all life on this planet.